The Colosseum or Coliseum, also known as the Flavian Amphitheatre (Latin: Amphitheatrum Flavium; Italian: Anfiteatro Flavio or Colosseo, is an oval amphitheatre in the centre of the city of Rome, Italy. 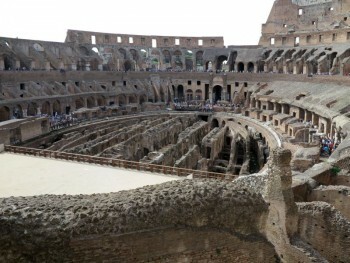 Built of concrete and sand, it is the largest amphitheatre ever built. 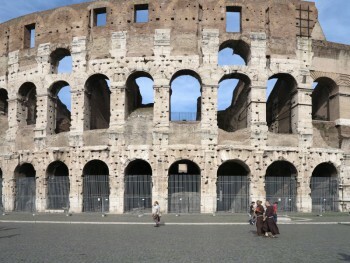 The Colosseum is situated just east of the Roman Forum. Construction began under the emperor Vespasian in 72 AD, and was completed in 80 AD under his successor and heir Titus. Further modifications were made during the reign of Domitian (81–96). These three emperors are known as the Flavian dynasty, and the amphitheatre was named in Latin for its association with their family name (Flavius). Although partially ruined because of damage caused by earthquakes and stone-robbers, the Colosseum is still an iconic symbol of Imperial Rome. 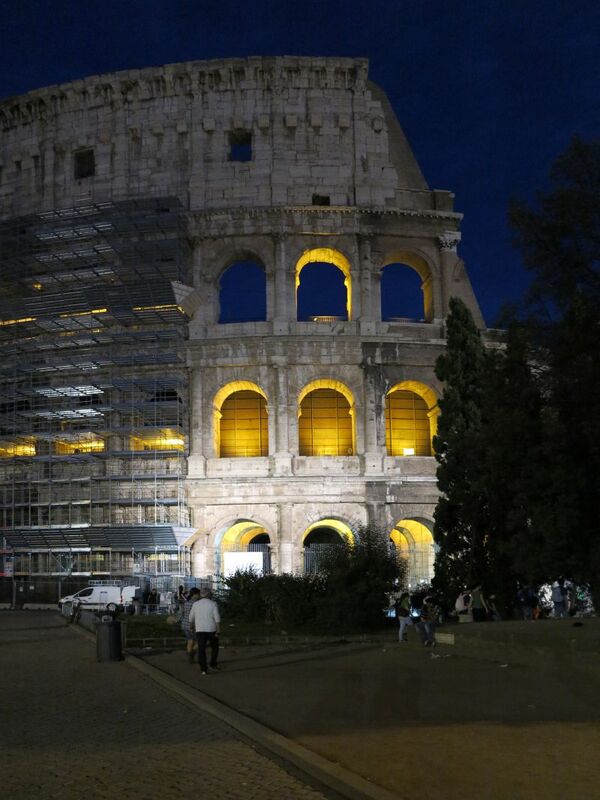 It is one of Rome’s most popular tourist attractions and has also links to the Roman Catholic Church, as each Good Friday the Pope leads a torchlit “Way of the Cross” procession that starts in the area around the Colosseum. The Colosseum’s original Latin name was Amphitheatrum Flavium, often anglicized as Flavian Amphitheater. The building was constructed by emperors of the Flavian dynasty, following the reign of Nero. 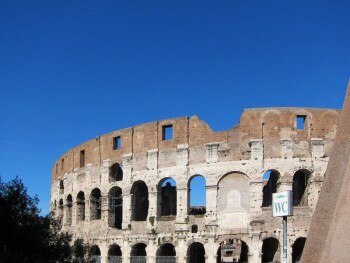 This name is still used in modern English, but generally the structure is better known as the Colosseum. In antiquity, Romans may have referred to the Colosseum by the unofficial name Amphitheatrum Caesareum (with Caesareum an adjective pertaining to the title Caesar), but this name may have been strictly poetic as it was not exclusive to the Colosseum; Vespasian and Titus, builders of the Colosseum, also constructed an amphitheater of the same name in Puteoli (modern Pozzuoli). The name Colosseum has long been believed to be derived from a colossal statue of Nero nearby (the statue of Nero was named after the Colossus of Rhodes). This statue was later remodeled by Nero’s successors into the likeness of Helios (Sol) or Apollo, the sun god, by adding the appropriate solar crown. Nero’s head was also replaced several times with the heads of succeeding emperors. Despite its pagan links, the statue remained standing well into the medieval era and was credited with magical powers. It came to be seen as an iconic symbol of the permanence of Rome. In the 8th century, a famous epigram attributed to the Venerable Bede celebrated the symbolic significance of the statue in a prophecy that is variously quoted: Quamdiu stat Colisæus, stat et Roma; quando cadet colisæus, cadet et Roma; quando cadet Roma, cadet et mundus (“as long as the Colossus stands, so shall Rome; when the Colossus falls, Rome shall fall; when Rome falls, so falls the world”). This is often mistranslated to refer to the Colosseum rather than the Colossus (as in, for instance, Byron’s poem Childe Harold’s Pilgrimage). However, at the time that the Pseudo-Bede wrote, the masculine noun coliseus was applied to the statue rather than to what was still known as the Flavian amphitheatre. The Colossus did eventually fall, possibly being pulled down to reuse its bronze. 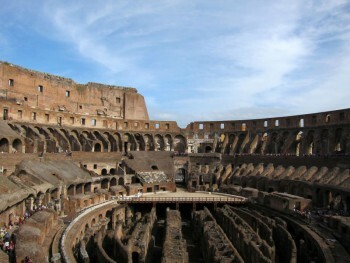 By the year 1000 the name “Colosseum” had been coined to refer to the amphitheatre.